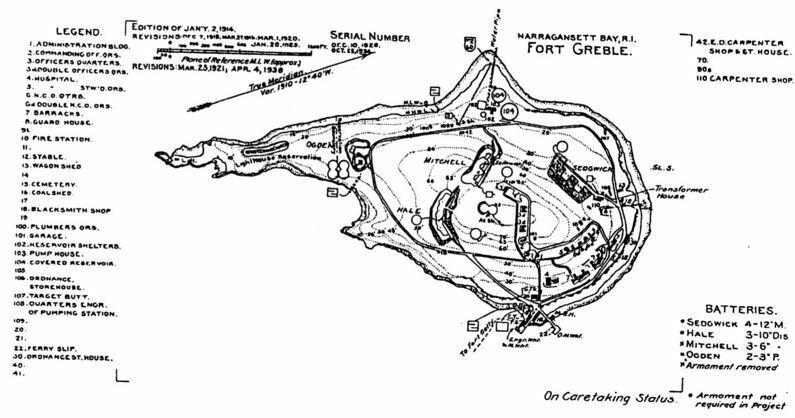 Fort Greble (2) (1898-1946) - An Endicott Period Coastal Fort first established in 1898. Named in G.O. 59, 1898, after 1st Lieutenant and Bvt. Lieutenant Colonel John Trout Greble, 2nd U.S. Artillery, the first United States Military Academy graduate killed in the U.S. Civil War and perhaps the first Union officer killed in that war. He was killed at the Battle of Big Bethel 10 Jun 1861. Post abandoned in 1946. Part of the Harbor Defense of Narragansett Bay. Construction of the four Endicott Period gun batteries began in 1897 and was complete by 1904 at a total cost of $ 334,809. Initial post construction continued between 1898 and 1904. Officers row initially contained six sets of quarters, the commanders quarters, three single captains quarters and two duplex lieutenants quarters. Two 109 man barracks and several sets of NCO quarters housed the enlisted men. 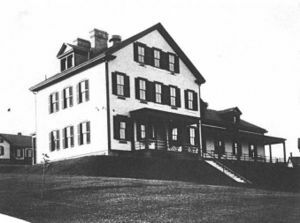 A 12 bed hospital and hospital stewards quarters were built along the road from the wharf. By 1910 the small post was essentially complete. The U.S. entry into World War I resulted in a widespread removal of large caliber coastal defense gun tubes for service in Europe. Many of the gun and mortar tubes removed were sent to arsenals for modification and mounting on mobile carriages, both wheeled and railroad. Most of the removed gun tubes never made it to Europe and were either remounted or remained at the arsenals until needed elsewhere. During the World War I conflict Fort Greble lost four of the eight mortars at Battery Sedgwick and all three of the 10" guns at Battery Hale to other locations. The post expanded significantly during the war with many temporary buildings constructed. Many of those buildings can still be seen on the 1921 version of the post map but are gone on the 1934 version. Some of these temporary buildings were used to house German prisoners of war. After the war, a significant reduction was made in coastal armament and Battery Ogden was disarmed and the guns shipped off. 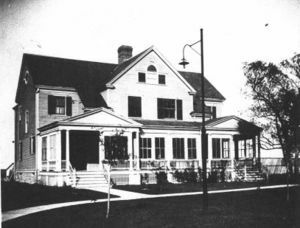 The post was in a caretaker status for much of the period between World War I and World War II but continued to serve as a training site for the National Guard. The permanent buildings on the post continued to deteriorate over this period and by June 1941 there were few serviceable buildings left. Only one building was classified in "good" condition and that was a 109 man barracks that had been renovated. The post capacity was listed as 5 NCOs and 109 enlisted men in June 1941. At the beginning of World War II only Battery Sedgwick and Battery Hale remained armed and they were both considered obsolete. Both of these batteries were outranged and too slow firing to be useful and they were scrapped in 1942 during the first large scale scrap drive of the war. Most of the remaining 12 inch coastal mortar batteries were also victims of the War Department's quota in this scrap drive. At the end of 1942 Fort Greble had none of the Endicott Period batteries armed. Part of Dutch Island State Wildlife Management Area Park. Location: Dutch Island State Wildlife Management Area Park, Dutch Island, Newport County, Rhode Island. This page was last modified 20:55, 7 January 2019 by John Stanton. Based on work by Bill Thayer and Richard Wong.